Belgium I’m in charge of training activities and accompaniment for youths and adults. This project gives the opportunity to share resources and practices with various actors (teachers, experts, counsellors, public authorities) in Belgium and in other European countries. Strengths: the Portal evokes cultural diversity and dialogue; its capacity to develop and evolve is very interesting. Belgium The strengths of this portal are its large-scale dissemination of good practices and actions conducted in the field. This portal is also a good diffusion channel of information on what exists in other countries (ex: the school violence prevention and management guide produced by the ministry of compulsory education in the Fédération Wallonie-Bruxelles) and methods developed abroad. Romania I believe that the methods and materials available on the project portal address the students’, parents’ and teachers’ joint educational needs due to the fact that they contain behavioral suggestions, legislative opportunities, methods and techniques to identify the main risks categories, examples of best practices. Not to be overlooked is the fact that the educational resources can be found in several languages, which facilitates accurate and efficient reception of the message, addressing a large audience. Belgium Thanks to the workshops organized, I have the chance to meet professionals who carried out researches or who work with students who are dropping out, I can make contacts with colleagues who experience the same reality, I can easily have access to several studies, subjects related to early school leaving. The studies / documents prove that this problem is a European phenomenon and that we need to share our practices to curb the problem. Italy A section of the School Safety Net Portal very important to help teachers is the one related to the testimonials of real situations, in particular the cases scenarios. Reading and reading up on situations very close to the school daily life allows you to reflect on such experiences, both directly and indirectly. The variety of issues addressed covers all aspects of the difficulties students may meet, especially in the two years of secondary school compulsory education: bullying, integration of foreign students, learning disabilities and immigration. Having a vast and varied repertoire allows you to share your experiences with other European countries and to better assess their own direct experiences. Publications and experiences complete the picture of the resources available. School Safety Net is a very important project for a real help for all those who work in schools, useful even to involve other people working in education, and families. Even in situations that are not completely positive, it is important - as it appears in the Project - the development of solutions and successful results, especially through clear and shared strategies. Portugal The portal is very straightforward to use. It is very comprehensive, I mean, it has all kind of necessary and related information, in a very readable form (short and clear articles). The testimonies, the examples of different experiences, projects are very useful and helpful. Spain The website of the SSN project is a modern design with an easy to use page. In the menu I found a lot of very interesting things to read and thus have resources to use when we pass a similar case of absenteeism with our children. Turkey The impressive part of the portal was stories about children who have problems in school. The most interesting thing was I have always thought that my son and our family had these kinds of problems. Lots of children and parents are trying to deal with these issues. After reading this portal I have hope, and feeling better because I know that I am not alone and there are so many sophisticated people around waiting to help me. As a result I found this portal very useful and give good information about our issues. Greece A couple of months ago, my husband and I came aware of our oldest son's dyslexia. Soon we started searching the web for more information on the subject. We found the Training Sources collection on dyslexia provided by the SSN portal a great starting point. By studying the material provided by professionals, we were really assured that we could go through all this safely. Italy I have visited the portal SSN and I found it very useful material to deal with competence the situation of young people at risk. I will recommend to my colleagues to use the material SSN when will have to deal with youth issues. Spain The prevention of early school leaving , is among the main priorities of the various education authorities and school counseling teams, which is why the purpose of the portal itself is a strength thereof. Another advantage of this website is to be addressed to all educators involved in the teaching-learning process (teachers, principals, students, parents) , offering specific for each resource profiles . Success stories, pose a direct reality of schools approach and could be used as a powerful methodological resources for working with students, teachers and families who are involved in similar situations. Romania Reading the success stories from the SSN Project I've gained a valuable insight into how to work with troubled teenagers. The commitment proven by some fellow teachers motivates me as well, when dealing with a difficult case. Greece Despite the fact that I had previous experience with bullying, in most cases I was improvising. The material in the portal gave me more information in the area. The success stories really helped me in using new methods and approaches in order to come to a successful result. The portal is a tool for me. I hope that it will be remain active and up-to-date even at the end of the project. Italy I approached with interest the portal of School Safety Net, because the strategy against early school leaving is one of its purposes. I very much appreciated : the approach to the four themes ( on the basis of experiences of various kinds - success stories, training products , literature - as a foundation for building guidelines to test and validate case- scenario); the pragmatism of the method , so we try to give the actors of the ""theater"" of the early School Leaving of a sequence of possible actions in relation to the context. Portugal The fact that the project has chosen as method to collect case studies creates a close link to reality and by highlighting success stories it stimulates other success stories. Spain I think that ""The School Safety Net Project"" can help us to find the keys to reduce the failure rate in schools. Since the measures proposed affect changes in public administration, from families, by schools and teachers and the students. Italy I found the material of the SSN project very interesting; in particular the guidelines helped me to reflect on the issue of early school leaving. Indeed, those who drop out of school and training appear to have common profiles related to the economic and social status of the family, ineffective learning styles and lack of self-esteem. In the past I thought that "profiling" better students was dangerous because of the risk of discrimination, but then I thought of what Don Lorenzo Milani used to say: "Nothing is more unjust than to equally divide between unequal people" (from the Letter to the Judges 1965). Italy “School failure is not unavoidable”. This is the main idea of the guidelines at the basis of the School Safety Net project, which prove to be an effective mean to prevent and overcome all those risk factors causing early school leaving. School, nowadays, mirrors the changes of a society where multiculturalism and “diversity”, be it of ethnic, social, cultural origin or in as far as learning styles are concerned, are everyday matters. People meeting and working in such a multifaceted environment thus face a difficult task to comply with. In this respect, the School Safety Net project guidelines, with their division into four thematic areas, meet the needs of the several actors involved: policy makers, headmasters, teachers, parents and students. They aim at identifying the main bottlenecks and strengths, as well as threats and opportunities arising both on the part of experts dealing with school management and of users. They thus provide all of them with appropriate educational supports and organizational responses in order to make the school a suitable place to live in. Romania The Methods and materials posted on the project portal are useful tools for identifying educational actors prone to violence, whatever its form of expression, for preventing and combating violence in schools and families. Good practice guides posted are applicative, meaning that there were selected those which can be used in all geographic areas, without limitation, regardless the local culture and civilization, ethnic, political or religious beliefs. Portugal The platform allows us to compare the different interventions, strategies, resources and methodologies used in other countries in the prevention of early school leaving. It also helps us to reflect on the purpose of what is done in Portugal by allowing us to strengthen or even upgrade a variety of methods, instruments and procedures. I think the portal allows easy access to all areas of the project and explains clearly what is intended with the project. Spain I showed the website to my mother and said to get very interesting. Spain This page is fine, because for example, the set is very nice and has many colors that attract attention, the database has many things to see, members of the project are many and many cool countries. I have seen that there are some things that can be used as games. Portugal The project portal is very intuitive. That allows all the users to access all the important information, such as testimonial, trainee courses, partnerships, very easily and quickly. The search filters are also very well-conceived. Portugal In terms of layout, the initial page of the portal provides a simple view of available content. The left side menu is always visible and allows the user to visualize all the options. For those who are not fluent in English, the horizontal menu bar on the left offers 7 optional languages. As far as content is concerned, the collection of success stories (138), the diversity of perspectives (school headmasters, teachers, students and parents), the panoply of countries involved (seven) and the focus on the positive potential of schools and the main actors involved to find solutions for their own problems is impressive and even empowering. Romania The topics posted on the website of the project are a best practice guide for teachers in treating the social and behavioral problems of the students and can be successfully developed in school activities. Greece The portal provides a good general view of the difficulties a teacher could face in the modern school. Keep up the good work. Greece I find interesting success stories that game me “ideas” on how to behave in my class immigrants, as there are a lot of students of Albania in my class. I have to confess that I didn’t and don’t have behavior problems in my classes but for sure the school safety net website is like a “manual” to my lessons. Belgium Thanks to some of the contents I have more resources to feed my training activities for students and professionals of specialised education. Main strength: gathering various resources. Participating in this project, I could dispose of different theoretical input and especially different projects to keep students at school. Turkey I think the best part of this portal is ‘Successful Stories’ especially. I enjoyed a lot reading other good and thriving stories from all around Europe. I think this sharing is very beneficial for getting deeper in the project and makes a good motivation for us in other countries for being aware that we have school failure problem and we all have to deal with the help of others. And the other good usage is publications because I have found good report results from other countries, and general situations from Europe with OECD reports. After all I have found the portal well organized and user friendly, also gives chance to look overall the situation in Europe. Belgium I am a school teacher and in my activities I have to face pupils at risk of school dropping out. The contents of the School Safety Net Portal and the discussions with colleagues from Belgium and other countries help me to better understand the problem and to find more adequate responses in the concrete situations of the daily life. Romania The variety of the educational resources and the various manners of approaching serious problems the nowadays school faces represents a tremendous support for all the actors involved in the educational process. All the success stories can be inspiring and useful for students and risk, the reviews of training and educational materials as well as the reviews of publications stand out due to their realistic approach and practical aspect. 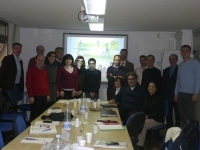 Italy I have followed with interest the School Safety Net project. The School Inclusion and Stay @ school projects have increased my knowledge on the issues of school dropout making me grow into a European dimension. I find that in the database of the portal of the School Safety Net products included are a continuation of the themes already addressed in the projects mentioned above. The materials entered thus far are usable at different levels, there are reviews of the training very successful from the point of view of teaching , but also simple video that attest to situations related to the country of reference and are not transferable to other countries. Spain I was pleasantly surprised by the amount of information that can be found in it, and especially the variety of languages in which it is present. What I found it more interesting on the web, is the amount of resources provided to form us on the issue of absenteeism because facilitating the link and a brief description avoid wasting time looking for materials that do not abide by the objectives that need . Turkey I have used training sources a lot in the portal. All sources are well summarized and easy to catch up, the sub topics are all written and you can read as well as your interest. There are many brief papers and shows what is going on in other countries.I think the strength of the portal is bringing theoretical framework and practical issues together. We can get information about what is happening in other countries in daily school life and also get knowledge about general international results from other countries. Turkey This portal is an important glance on the Europe to create awareness about school safety issue. You can use it not only to get more information about what is going on around in the other countries, but, as a school teacher, you can find so many good examples of how teachers succeeded in bullying, immigration problems in their schools. By surfing on the web site and reading reports I could be a part of a big community of teachers and share our ideas about helping our students. I also read different publications and scientific reports, I have learned many new things and will try to use them with my students in my school settings. I think this portal is beneficial for teachers for learning new perspectives about the topic and getting new methods. Italy I looked quickly the products that are currently in the Databases section (success stories and reviews of training courses and books). Many of these materials documenting the particular situation and give useful indications to solve some problems through the use of instruments transferable between different European contexts. One of the strengths is the wealth of material relating to the four thematic areas that I intend to deepen later. Italy I surfed and consulted the portal of the project "School Safety Net" and I found many useful and positive aspects. The platform collects testimonies, research, documentation of significant interest to teachers, administrators, students and parents. In the portal, you can in fact deepen four issues closely linked to early school leaving: early identification of students at risk, integration of immigrant students, support for students with learning disabilities and the prevention of school bullying. Issues are highly topical in view of the European dimension of school, and the portal is able to effectively disseminate success stories in preventing early school leaving, reviews of training and educational materials, as well as reviews of publications on the topic of early school leaving. The "Database" provides a large series of success stories of school that allow the expert reader to find similar facts and examples of solutions even in very complex situations. The possibility to have an immediate confrontation with what happens in European schools - sometimes similar experiences, but where there is often a very different culture and organization - provides a broad framework, open to new ideas and full of suggestions for reflection. The "Guidelines" section provides a shared documentation for the acquisition of skills that aim to tackle and solve the problem of early school leaving. Moreover, the "case scenarios" are mostly interesting, being exemplary school events that have been chosen as the most representative, to provide material for reflection and deep consideration as far as the solutions, methods and strategies to be applied in everyday school life. The portal, as well as having a repertoire of experiences and "best practices", also allows feedback from users, giving the opportunity to comment on these experiences, by providing advice, information and enrichment on the issues raised and the experiences presented. Personally, I found especially interesting the possibility to have the content of the whole platform in the different national languages of the countries that participated in the project, as well as the opportunity to have useful information on the collection of websites and magazines specializing in the field of education, and, the last but not the least, a thorough bibliography on the issues addressed to make this portal a timely and efficient tool for users. Greece The portal is very useful, has a very good search filters and in many languages. As a teacher I found in the portal stories that are familiar to me. It’s for sure that I feel that I have found a responsive source that is expert to the difficulties of students. Greece I strongly believe that the material provided in the School Safety Net portal, is invaluable. All teachers (and parents too), should make the portal a main reference point for all subjects concerning student problems. It assisted myself training much more than I would have ever expected. Greece I found the material provided in the portal to be very didactic and useful for a newbie like me. Especially the “success stories” gave me the opportunity to think about the problematic situations that sometimes go by unnoticed. The “training sources” enhanced my reading and although I have not had a chance to check out the “publications” I ‘m sure I will find interesting and stimulating material. I hope the portal will remain active as long as possible. Greece The portal real provided me with information that I really do not know that existed. The training material was useful and some of the cases presented helped me in order to understand the depth of the problem. The success stories provided me with best practices that I could use. The material was and still is useful and it is my first point of reference in order to get a closer knowledge on specific item. The material is well written and well organized. The different cases presented in different countries gave me a global view on the same problem despite any cultural differences. Italy First of all, the portal is very straightforward to use. It is very comprehensive and all the informations are in a very readable form (short and clear articles). The issues having a relevant impact on early school leaving, described in the project, are very real. They can be shared by the schools of all countries in Europe. The homepage of the project School Safety Net has a good organization. We think also students will find it very clear, so they can be interested in visiting and exploring it, in all the sections. All areas of the Guideline are easy to visit and the descriptions inside are very synthetic but complete. The Guidelines contain very interesting thematic areas and the descriptions are made by bulleted list, as a useful and practical guide. The most important thing is that they speak about a teamwork for fighting early school leaving: teachers are at the centre of the process, but they are not alone, they work in relationship with headteachers and policy makers. This project gives the opportunity to share resources and practices with various actors (teachers, experts, public authorities) in many European countries. The testimonies, the examples of different experiences project are very useful and helpful. Austria There is a clear correlation between early school leaving and low competences in reading. The educational work of public and school libraries can have a significant impact on the success or the failure of students. Nevertheless, many libraries need a re-orientation of their work and have to include actively immigrant students with poor knowledge of the language(s) of schooling and students with learning disabilities, e.g. by providing relevant reading material and by developing appropriate methods for approaching these target groups. Libraries must not be the domain of good readers only! Greece The whole effort in the School Safety Net is really impressive. I was informed by a colleague of mine for the activities and the material available in the portal. I started reading the whole concept for students with learning disabilities and I think that there are cases that I can really improve my services to the students. My favorite part of the portal is the case scenarios and the information related to the solution. Excellent work on the guidelines. Greece Excellent work, great functionalities, nice presentation on the information collected. I am reading the whole material in my limited free time during school intervals and at home. Although I am not too experienced in similar cases, the problem of early school leaving has started to be an active problem in my school. The quantity of the material in the portal is huge. I think that there is also quality in the sources selected. Try to keep on working in this area. Spain At first I did not know how to use the site until I translated into Spanish. I think a very interesting site to investigate because anyone does not think that when you leave your children at school, he can have many problems within it. Now, when my son comes home I ask more about the school, as he has done, if he has had any problem coexistence. I think I will use the site to see if he has any problem explained in detail on the site. Spain The page I saw served me much because my child has attention deficit and is discriminated in school by this, in fact, in the section of the testimonies I could really identify with one of them. Spain What I have to highlight in the project and in its methods is the willingness of teachers to change the situation, usually because their work environment is disadvantaged socially, and stressed the exchange of ideas and forms of action of the parents. This change seems more important and necessary when it comes to primary education. In relation to cases of secondary education I must emphasize the necessary involvement of peers to promote the solution. Spain When you access to the SSN portal (School Safety Net), you can see four main issues in school: identification of students at risk, integration of immigrant children, and prevention of bullying and struggling students at school. The most important part is Guidelines, also divided into sections with a lot of well classified contents. In addition there are also sections for parents, children and teachers, with basic instructions that everyone can follow. We can also see relevant projects that have been done about the subject and forums where everyone can comment the cases scenarios and the possible strategies to cope with it. In short, this website is a very innovative and creative idea because we can obtain resources and answers to the problems we see in school. Spain As can be seen, this page is aimed to provide information on how to prevent early school leaving, specifically focusing on four possible causes: students’ at risk, integration of immigrants’ students, prevention school bullying and students with learning difficulties. In each of these sections are provided information directed towards the different roles (Head Teacher, Parents, Policy Makers, Students and Teachers) that are directly or indirectly involved in each of these causes to help prevent dropouts. On the other hand, in the section “Database” is provided documentation and tools that can be used to get above stated objective. These tools and documents are classified according to their origin, namely: “Success Stories”, “Training Sources”, “Publications” or “Teachers Experiences”. Also, in the section “Case Scenarios” several cases have been exposed in relation to each of the above mentioned issues. These cases have been receiving criticism, suggestions for solving problems, explanation which also provides information to achieve the project objective. Finally, note that there are other sections that explain more about the project (“Project Info”), project members (“Partnership”), other related projects (“Relevant Projects”), contact of the main contributors is provided (“Contacts”) and are given news related to the subject matter (“News”). Personally, I find a website very useful and easy to use, with lot of information, tools, tips and resources that can help prevent early school leaving. The site is easy to use. Also is available in multiple languages, which is helpful if you don’t have a good level of English. Spain I find this website very useful, both in the information provided and utilities to which we access. On one side you could say that the distribution of the interface is appropriate because everything is found ordered and the access is easy and intuitive, you can read in any language. On the other side, it is necessary to underline the large amount of different information that you can access, because we can know about different experiences about all participating countries, links to many projects and magazines on the subject, also areas where download information, testimonials of the participants. Spain When I entered the page I did not know what it was, it looked like the cover of my English`s book, but with the help of my mother I researched cases in the Guidelines section, which helped me to identify moments that happen in my class all day, like when my “Romanian” friend does not allow you to play at recess, or like when Carmen is pushed by other girls because she has a different wrist. Spain The cases shown in the ""Success Stories"" are interesting and a very positive aspect is that they are stories with a good ending. That always encourages parents and reminds us that problems for our children can be solved. An aspect that could be improved is to discuss more explicitly what strategies were launched from school to avoid or mitigate the effects of absenteeism in these classes, so that we parents know what chance do we have or we can offer. The section on training materials is fine, because it collects a lot of material and links to online resources. I think it is more focused on the training of teachers. There are many links to other materials in Spanish that are interesting for parents. The rest of the resources available on the page are fine. I suggest to improve the Spanish translation, in order to help also those parents, which have some troubles with English. Portugal The resources available on the portal are very easy to access and important in mediation processes. The portal is well organized in several sections. I think that these resources are useful for social mediation and I particulary liked the EPTO project. Portugal The methods and results available on the SSN project portal are very useful to have an idea how to resolve many problems of integration in society by immigrant students. In the future in a social intervention this portal appears like one of the best resources. Portugal Some of the positive aspects are that resources are easy to access and they enable the integration of people in society. An aspect to be imprpved concerns language translations, as most experiences are only presented in English. Portugal In my opinion the resources available through the portal are very useful for intercultural mediation. The portal contains some very useful tools to gather a wider view on intercultural issues and to act upon them. Portugal The resources available on the portal are easy to use, interesting and innovative. They are key to solving immigrant issues. As a social worker I hope to be able to use these resources effectively. Portugal The resources available on the portal helped me get information and knowledge. I think the portal is well organized and it is easy to access information on it. The resources available are very important for social mediation and conflict resolution. Romania The guidelines posted on the Project Portal are excellent educational and didactic materials and comes in the help of the teachers from everywhere. The Portal is very useful through the studies and the life stories presented. I will recommend it to all my colleagues, Romanian teachers, in order to use the publications, strategies and all the materials produced in this project. Romania My involvement in School Safety Net Project implementation gave me the opportunity to have a great experience in producing of educational materials useful for all the actors from educational system, working with teachers from different European countries. I realized that each country has concerns to decrease the number of students at risk and to help them to become active citizens. The Project Portal offers many publications, studies, educational materials, guidelines, success stories, case scenarios and strategies to solve them. This is an oasis of knowledge. This is a real support from a virtual environment. I invite all the teachers, students, parents and policy makers to use the School Safety Net Project Portal in their effort to decrease the early school leaving phenomenon and the number of students at risk. Romania The Project Portal has many strength points. It shows modern methods of addressing problem situations with a large scale of application in everyday life. It presents various and modern materials used in dissemination. Romania The Project Portal offers the opportunity to improve the way of relating over the pupils that share the same problems as the case studies. I have had the occasion to work with pupils at risk and with those having difficulty in learning and in this view the materials presented on the portal was of much help. Romania The school programs such as re-education and prevention of bullying and school dropout, programs that help to identify students at risk, students with learning difficulties or social integration, must be a priority of mass education system and especially a priority of the schools whose activity type is suitable for it (TVET high school, vocational school, etc. ), where, in most cases, the tutor is the class master. The school program, as it was designed, may suggest through the topics that address, useful topics and tips for the tutor engaged in activities with the students who belong to the categories listed above. Of course, to attract more participants (teachers, parents, students) the project must be held also in Romanian.